Maggie Hill and her brother are vacationing in Las Vegas when Maggie sees a strange vision. Right after, she and her brother lose 12 hours, with no memory of where they had been. The strange injuries they both suffered suggest something sinister happened to them during the lost hours. Fast forward, and Maggie is home trying to live a normal life, but struggles with the sense of something wrong and missing. 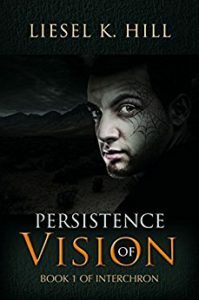 A creep with a spider tattoo on his face attacks her in her home and she’s saved by Marcus, a man who clearly knows her, but she only has a vague feeling she’s met him before. He takes her through a time portal into the future—one where individuals are hunted and killed; one where the vast majority of humanity is part of a collective, hive-mind. Maggie somehow has the clue of how to stop the leaders of the hive-mind, but it’s buried in her lost memories. She must learn—again—how to function in this different society and regain past friendships, and perhaps reignite her relationship with Marcus she has no recollection of. This is an adult dystopian novel, and a welcome change to all the YA dystopian books out there. It kept me interested and I enjoyed the unique, intelligent spin on the future failure of society. It made me wonder how I would react to meeting people who obviously know me well, but I have no memory of them.